A pair of commensal snapping shrimps Synalpheus on their host crinoid. Photo from here. As a child, snapping shrimp were one of my favourite things to find under rocks at the beach. The characteristic bang made by their enlarged pincer snapping shut never fails to fascinate. This 'snap' can often be heard for some distance, and the explosive force generated by it can be strong enough to stun small animals that get too close. Snapping shrimp form the family Alpheidae, and Synalpheus, with well over a hundred described species and counting, is one of the larger genera in that family. Synapheus has a pantropically-centred distribution. Though it seems to be more abundant in the east Pacific and Atlantic Oceans than in the Indian, I'd be a little suspicious of the role collection bias has played in this. The various species of Synalpheus are retiring animals by nature, and sequester themselves in cryptic habitats, all the better to defend themselves against would-be intruders with that impressive claw. 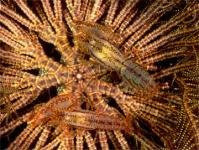 The best-known species of Synalpheus live within the body cavity of other animals such as sponges or corals, and a few species live on the underside of crinoids (VandenSpiegel et al., 1998). It is debatable to what extent the relationship between Synalpheus and their host should be regarded as commensal (with the shrimp feeding on food particles brought in by the host) or parasitic (with the shrimp feeding directly on the host tissue), as evidence exists for Synalpheus individuals doing both. Dardeau (1984) suggested that Synalpheus species could be divided into three broad levels of host association, from group I (generally free-living or opportunistically commensal species with very low or no host specificity) to group III (invariably commensal species with high host specificity). Many commensal-living individuals will do so as male-female pairs, aggressively excluding any conspecific competitors that attempt to settle in their home. Other species may be more tolerant, with numerous individuals in a single host. Colonial Synalpheus on a sponge. Photo from Biology-Blog - this would appear to be a laboratory colony, with dabs of identifying paint on the individuals. The most remarkable association of all, though, is found in certain species of what is called the Gambarelloides species group (after the species Synalpheus gambarelloides). The Gambarelloides group is a morphologically distinct association of species (most notably, they have a dense brush of setae on the smaller pincer) that was separated by Ríos & Duffy (2007) from the remainder of Synalpheus as their new genus Zuzalpheus. This separation was debated by Anker & De Grave (2008), but the complaint does not seem to concern the integrity of 'Zuzalpheus' itself, but that of the remainder of Synalpheus if the Gambarelloides group species are not included. Some of the group III sponge-dwelling species in this group (using Dardeau's grouping) form large colonies with hundreds of individuals in a single sponge. It was only recognised as recently as 1996 (Duffy et al., 2000, 2002) that these Synalpheus colonies actually qualify as eusocial, in the manner of bees and ants, representing the only known occurrence of eusociality outside insects other than mole rats. Reproduction within the colony is conducted by a single queen, though it remains unknown how the queen of a colony is established, and how she prevents other members of the colony becoming reproductive. The sexual ratio of the remainder of the colony remains unknown, as males are indistinguishable from non-egg-bearing females (and gender may be environmentally-determined rather than genetic), but the colony does include a number of larger individuals (called "males" by Duffy et al., 2002) that seem to be primarily responsible for the colony's defense, moving about the sponge more than the smaller juveniles seemingly on the lookout for intruders. 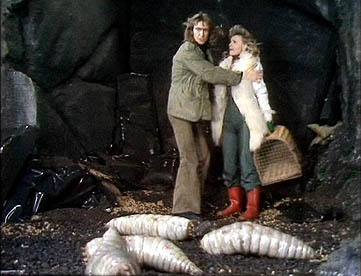 The queen plays little part in defending the colony, and in one eusocial species, Synalpheus filidigitus, she lacks the large snapping pincer of the other individuals (Duffy et al., 2002). It is not yet established how fertilisation of the queen occurs, but allozyme analysis suggests that there may be only a single reproductive male in the colony (Duffy et al., 2000). Phylogenetic analysis of the Gambarelloides group by Duffy et al. 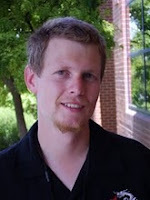 (2000) found that eusociality has evolved at least three times within the group. They suggested that it may have evolved as a response to severe competition for habitat. 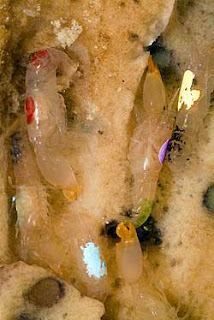 Where eusocial shrimps are found, almost all suitable hosts are home to a colony, so unoccupied homes are few and far between (offhand, how new colonies do become established is yet another unknown factor - eusocial Synalpheus lack a planktonic larval stage, so hatching offspring remain in the parent colony). A colonial group may be more effective at defending their host against would-be usurpers than a solitary individual or pair would be. With the large "soldiers" defending her, the queen is able to spend more time feeding and reproducing, safely hidden within the sponge. Anker, A., & S. De Grave. 2008. Zuzalpheus Ríos and Duffy, 2007: a junior synonym of Synalpheus Bate, 1888 (Decapoda: Alpheidae). Journal of Crustacean Biology 28 (4): 735-740. Dardeau, M. R. 1984. Synalpheus shrimps (Crustacea: Decapoda: Alpheidae). I. The Gambarelloides group, with a description of a new species. Memoirs of the Hourglass Cruises 7 (2): 1-125. Duffy, J. E., C. L. Morrison & K. S. Macdonald. 2002. Colony defense and behavioral differentiation in the eusocial shrimp Synalpheus regalis. Behav. Ecol. Sociobiol. 51: 488-495. Duffy, J. E., C. L. Morrison & R. Ríos. 2000. Multiple origins of eusociality among sponge-dwelling shrimps (Synalpheus). Evolution 54 (2): 503-516. Ríos, R., & J. E. Duffy. 2007. A review of the sponge-dwelling snapping shrimp from Carrie Bow Cay, Belize, with description of Zuzalpheus, new genus, and six new species (Crustacea: Decapoda: Alpheidae). Zootaxa 1602: 1-89. VandenSpiegel, D., I. Eeckhaut & M. Jangoux. 1998. Host selection by Synalpheus stimpsoni (De Man), an ectosymbiotic shrimp of comatulid crinoids, inferred by a field survey and laboratory experiments. Journal of Experimental Marine Biology and Ecology 225 (2): 185-196.